The Permaculture of Soil, Part 2. In my last post I said that while organic matter constitutes the smallest proportion of the non-living components of the soil, it may have the biggest importance. 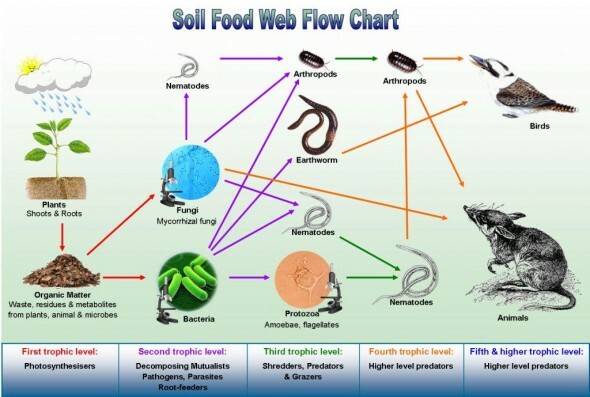 This is because it’s the basis of the soil food web (the food chain of the soil ecosystem) and it has many special properties that enable life to thrive. Organic matter in the soil starts out as dead plant and animal material which either falls on to the surface or occurs beneath it (dead plant roots and soil organisms). These materials then go through various stages of decomposition thanks to a variety of soil organisms and eventually become a substance called humus. This dark brown/black goo is what gives a good soil it’s rich colour and to a large extent, its fertility. Most gardeners know that earth worms (lug worms) are their allies. 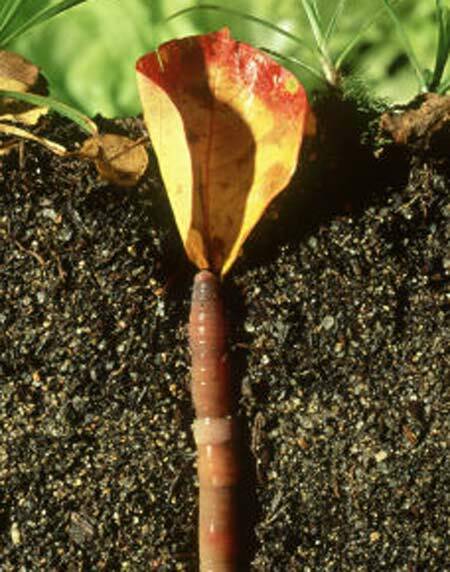 Worms live in the top soil and come to the surface to find fallen plant materials such as leaves. They pop up and search around until they find something good, then they drag it down into their burrow, where they wait for microorganisms to help break it down so they can eat it. Their digestive system uses mineral particles from the soil to help to grind up the plant materials which means that what emerges from the other end of the worm is a gooey combination of decomposed organic matter and minerals – perfect soil! Simply by pulling organic matter from the surface in to the soil the worms are playing a vital role in incorporating it into the food chain. Other helpful behaviour is the burrowing that worms do, making thin channels through the soil which improves the structure and allows air and water to penetrate. The gooey nature of worm castings and humus helps to form aggregates by sticking particles together into ‘crumbs’. This makes the soil stable and less prone to erosion or compaction. Improved structure means that the soil can hold on to water for the plants, but also be well drained and not prone to water-logging. Dead plant materials can be fibrous and hold water and air, while humus acts like a sponge, absorbing water and with it, nutrients. Organic matter contains a certain amount of nutrients which plants need, but this varies according to what it’s made of. Often these nutrients are locked up in a non-soluble form that is unavailable to the plants, and are only made available via microbial activity which converts them to a soluble and available form. Once nutrients are soluble they are also leachable and will be washed away from the plant’s roots unless the soil can hold on to them. This is where the water-holding ability of organic matter is so important. The water held contains soluble nutrients – plant food. Humus has between 2 and 10 times the nutrient holding capacity of clay, therefore small amounts make a big difference. Woody materials and tree leaves are generally consumed by fungi which form large networks of mycelium beneath the surface of the soil. Mycelium is the body of the fungi and the mushroom is the fruit. Soil-based fungi can spread over large subterranean areas and behave in a curious and wonderful way by connecting up the root systems of different plants. It turns out these mycelium networks function as an exchange between the fungi and the plants, and between different plants which are connected. Nutrients and water can be exchanged where there is an excess in one area and a need in another. This is how plants which can ‘fix’ nitrogen (via a symbiotic relationship with certain bacteria) can make it available to surrounding plants. Adding organic matter to your soil is a great way to increase the fertility because it contains nutrients, it holds air, water and soluble nutrients and it gives good structure. The affect of organic matter in soil is disproportionate to its quantity. Organic matter provides food and habitat for the organisms that make up the soil food web. These organisms help to turn organic matter in to humus, the many qualities of which are outlined above. They also make the nutrients in that organic matter available to plants and other soil life. They are the invisible factory that recycles nutrients and enables natural self-sustaining systems. As the diagram shows animals, plants and fungi are interdependent, forming complex food chains, and many co-operative and symbiotic relationships. We take organic matter out of the system in the form of food, so to keep the system functioning we must replace that organic matter in a form that will feed the system- compost, manures, etc. Other than that we need to leave it alone to do what it does, and has evolved to do over millennia. In my next post The Permaculture of Soil, Part 3: How do we care for our soil? I will give some practical guidance on looking after what you’ve got at home.